How Can Philanthropy Help Grow Your Bottom Line? You can’t pick up a local newspaper in any community in the country this time of year and not see companies doing philanthropic work. The holidays always remind us how giving back to those less fortunate makes us feel so good as human beings. But I have always wondered why these same feelings and charity activities aren’t practiced by companies more throughout the year. Would philanthropy be bigger if companies felt it would help drive business and grow their bottom line? When we decided to make giving back to others a priority within our company, I never imagined that it would actually help grow our business. I assumed it would give our staff a greater sense of purpose and make us feel good about helping othe rs. The advertising business doesn’t always give you a sense of a greater good; so making philanthropy a focus seemed like a no-brainer. Hiring someone solely focused on our philanthropic efforts was a big step. It required a significant financial commitment above the money and time we were prepared to donate to nonprofit organizations. But it turned out to be a fantastic message for the company. Employees saw firsthand that “giving back” wasn’t going to be some slogan on a cheesy poster; it was going to be baked into everything that we do. Having a full-time employee dedicated to philanthropy allows for us to engage in large-scale charitable efforts that double as major team-building initiatives. 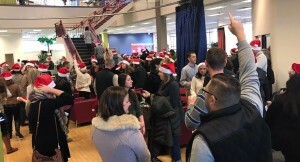 We’re most proud of the recent #HoHoToga2016 event, where all 150 of our employees came together at our headquarters for a holiday mission to benefit eight of our year-round partner organizations. 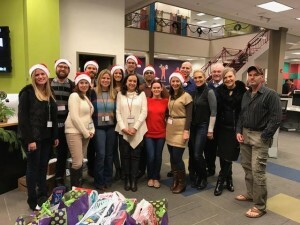 In lieu of client gifts, we flooded stores in Santa hats and shopped to fulfill the wish lists of our local nonprofits. The event took a huge amount of planning and coordination that wouldn’t have been possible without someone specifically focused on making it a success. Many of our employees had never done anything like it before and said it created impactful memories they’ll never forget. Now comes the surprise. Focusing on philanthropy is helping to grow our business. Not only does it create a positive impact on our culture, it is helping with retention, as employees want to make a difference in their communities. 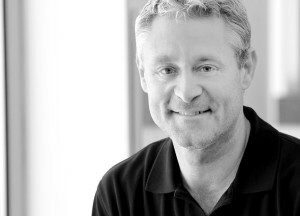 Engaged employees create great work, and our clients love great work and engaged employees. Externally, our perception within our community and with our clients is stronger because of giving back to others. We’re viewed as “one of the good guys” that people want to do business with. And as our efforts garner PR within the community from the charities that we help, it fuels social media, content storytelling, and search rankings that ensure more potential clients are exposed to our company. It was never our intention to drive PR when we set out to build community partnerships, but the increased positive coverage does serve as a catalyst for people to check us out and inquire about our work. Clients have said that they appreciate our dedication to philanthropic efforts, especially those causes that are related to health and wellness (given all the work we do in the healthcare space). It also shows that our employees are engaged, connected, and passionate—not only about their work, but also about giving back. Philanthropy will always be a huge part of our company, and I encourage all other businesses to give it a try year-round. You will love the results.